One good habit to start is to keep a period calendar. This is to give you a rough idea of when your next period is coming, or when you should start expecting the PMS to kick in. Coming up with your own period calendar also helps you have more control over your reproductive health and get a better understanding of your own body rhythms. The best part is, it doesn’t even have to be a physical calendar with pens and highlighters and all that fuss! Simply note these happenings down on your phone calendar, or if you prefer more privacy, downloading a separate period log (like the Laurier app! iOS | Android) would fill the bill just right! Keeping track of your period symptoms on a monthly cycle calendar is easy, but it’s one of those things that won’t work unless you do it regularly. On top of noting down when you start and stop your period, try writing down when you get cramps, mood changes, changes in your vaginal discharge, pain when you don’t expect it, or other symptoms you think might be period-related. You’ll likely see a pattern forming after the first few months. This allows you to foresee symptoms and be ready for them – Feeling a little moody and achy? Must be the PMS! Period due in a few days? Better stock up on pads! 1) Invest in Proper Pads! Periods don’t necessarily have to be dreadful and miserable – just learn how to manage them and you’ll find that they’re really not that bad! 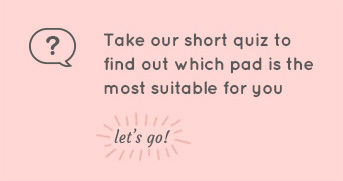 If there’s only one thing you need to get right during your period, it is the type of pad you use! It’s important that you invest in high quality pads to ease you through the week or so. A proper fitting pad made of the right surface material will reduce the risk of irritation and discomfort, which you will soon realize makes a great difference on your mood! Taking good care of your skin’s hygiene is also pivotal in ensuring you feel your best! While it’s normal that the increase in hormones naturally cause increased production of facial oils, you don’t have to let that affect you. Remember to always wash your face at the end of the day, and be sure to not introduce more bacteria to your face. Lack of proper care may lead to skin irritation and breakouts. We all have those days when the cramps feel so bad that we can’t help but just curl up into a ball on the couch. On the contrary, it would actually help to get up and move around a little bit! Light stretches and some lower body rotations can help to relieve the tension in your back muscles and ultimately alleviate your cramps. Why don’t you give it a try next time! Keeping tabs on what you eat and drink during your period may also affect your cramps! Here’s a few tip to help get you started! Try to cut down on fatty foods whenever you can. Increasing the amount of greens in your diet generally reduces the levels of inflammation in the body, which lessens your cramps and acne breakouts. Excessive caffeine and sugary drinks can also lead to elevated estrogen levels and fluctuating blood sugar levels. These could cause more intense cramps and also excessive fatigue and mood swings.